We offer wood switch plates for standard flat walls, round log walls or log siding walls. The only source of wood switch plates to match the rustic lighting in log cabins / homes with round log walls. Wood switch plates are the perfect complementary addition to any rustic lighting application. switchplates for round log walls or log siding walls. Our standard size wood switchplate is actually 3/8" wider and taller than the industry standard switchplate to cover imperfections around electrical boxes. Our wood switchplates have only 1/4" rise however, we can build custom switchplates with more rise (thicker) to accommodate electrical boxes that extend beyond the wall causing factory switchplates to not fit flush on the wall. We also build oversized switch plates larger than our standard sized wood switchplates. Custom switchplates, oversized switch plates, or wood switchplates over 6-gang are no problem. Oversized switch plates for round log walls are limited to length only. Custom switch plates for round log walls are also more limited on wood choices. 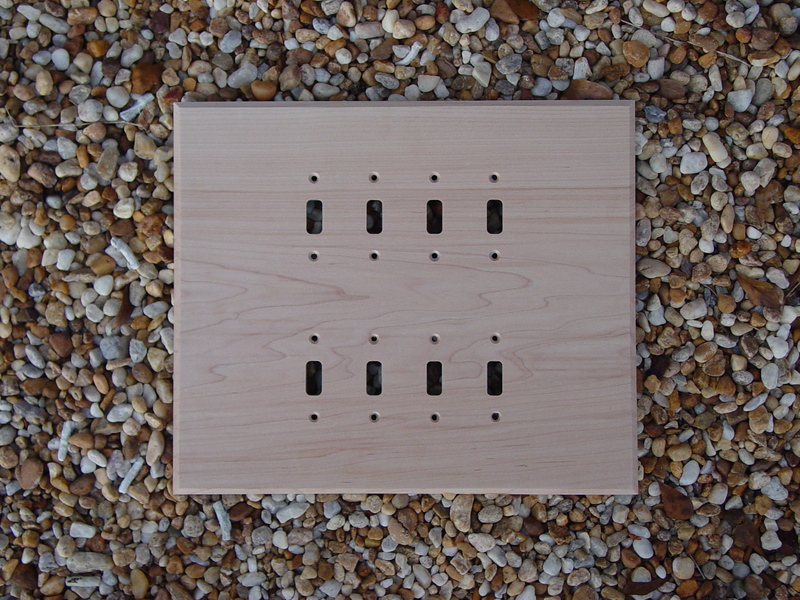 We do build most any wooden switch plate in most any configuration from most any wood type. If you don't see your wooden switch plates, custom switchplates or oversized switch plates here, it doesn't mean we don't build it. Give us a call and we'll build custom switchplates to your needs. Don't forget to check out our patented wooden switch plates for round log walls. We offer custom switchplates for most any size round log or log siding wall. Need an oversized switchplate or custom switchplate?? All we need is your specifications. The above oversized switch plate or custom switchplate is one solid piece of Maple with 8 toggles measuring 12 1/4" H x 14 3/8" L.